I love all the houses I put on House Nerd. 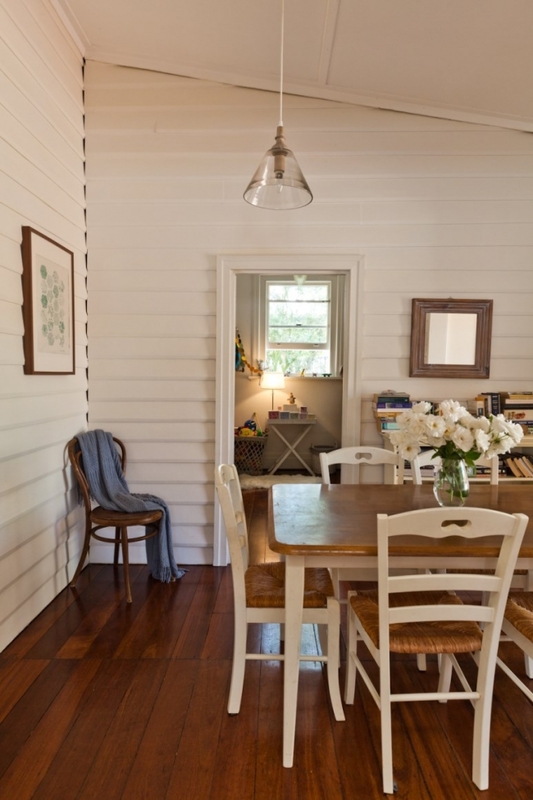 But with its unpretentious character details, classic weatherboard build and young owners who DIYed and decorated the whole house on a shoestring budget with lots of secondhand, op shop and side-of-the-road finds, this Palmyra cottage felt extra-special to me the moment I entered. 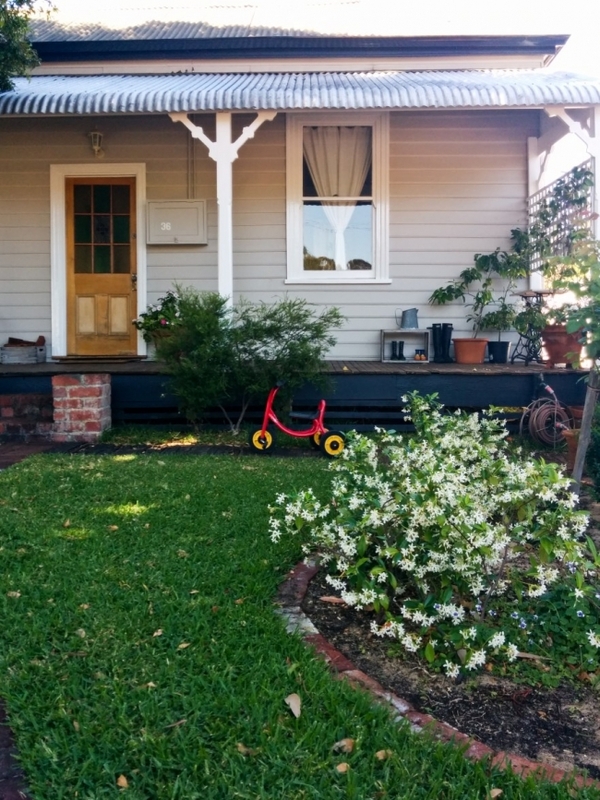 Katie Stanwix is one person who understands my love of Palmyra - she and her husband Ben, who now live with their sons William, 5, and George, 2, bought this cute cottage seven years ago when they were settling back in Perth after living in London. They were hunting for a home where they would eventually begin their family, and had their hearts set on finding an old character house in Palmyra. But finding such a house wasn't easy. 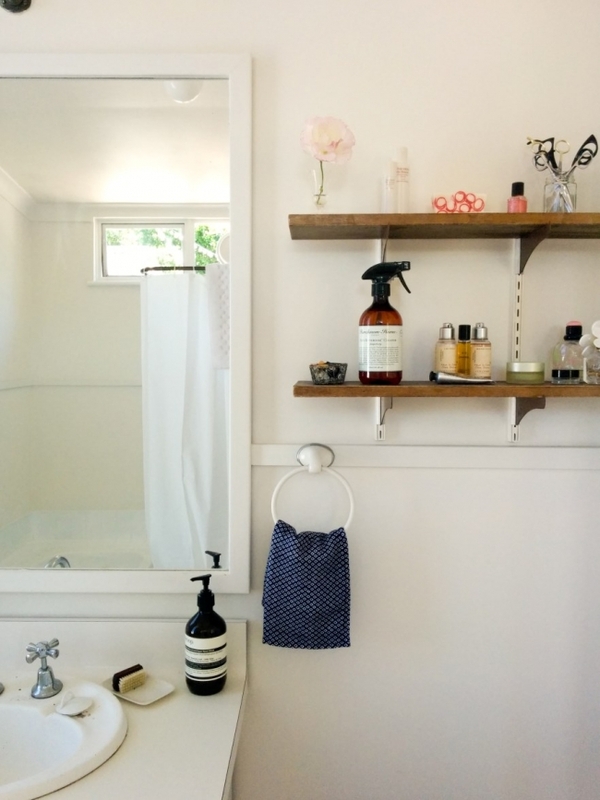 SIMPLE DOES IT: "Our home does not have a single 'fancy' feature. It’s about as simple as old family homes get!" says Katie. "It has suited us well because Ben and I are pretty happy with not a lot really. 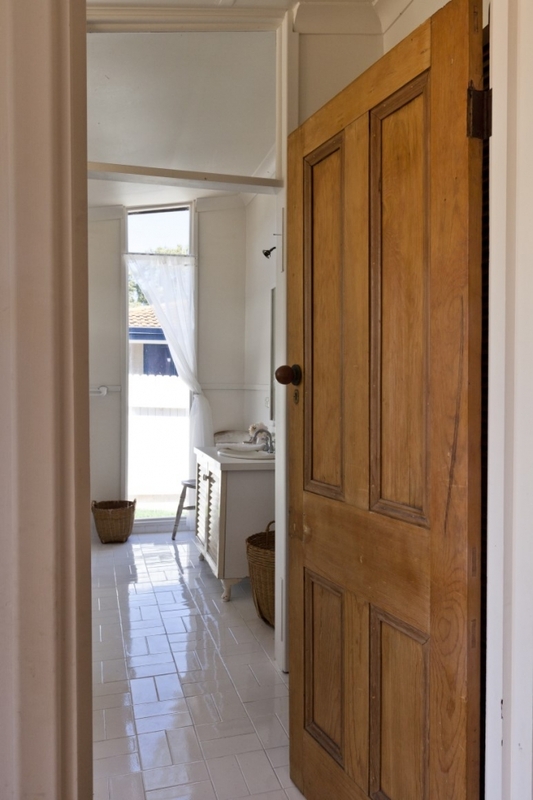 The kitchen and bathroom are very dated, and we did toy with renovating at one stage, but they both do the job so for us that’s been enough as it was never a big enough priority to make big cosmetic changes. 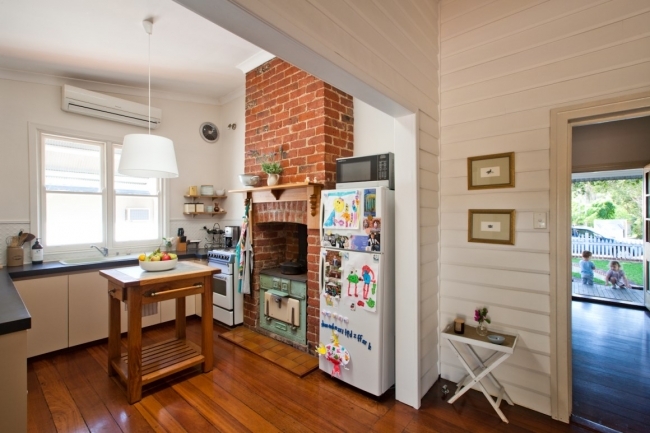 Ben did replace the '80s kitchen tiles with a pressed metal splashback." The beautiful glass pendant light caught my eye - Katie got it from Corner Store. Photo by Heather Robbins of Red Images Fine Photography. 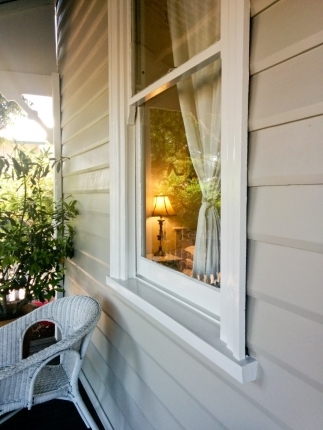 RECYCLED FROM A FRIEND: Ben replaced the ugly brown aluminium window in the kitchen with a double-hung timber sash window. 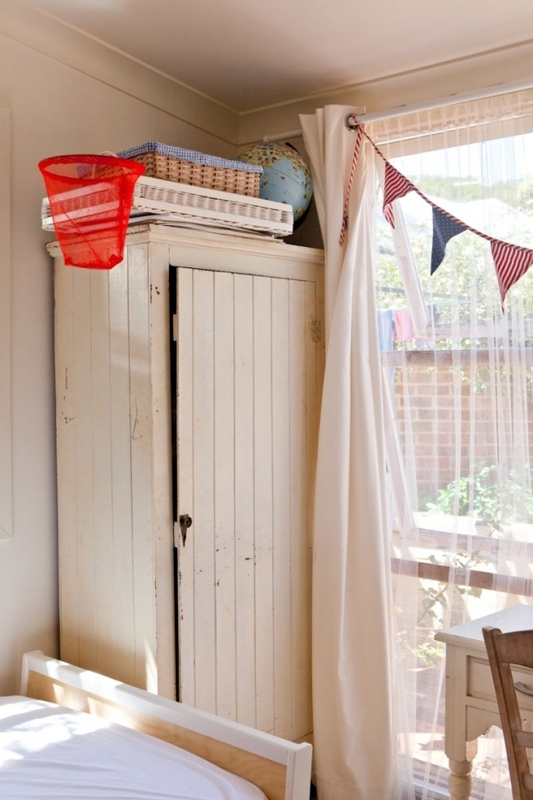 "We grabbed the window out of my childhood friend Anna's skip bin when she was redoing her house!" says Katie. 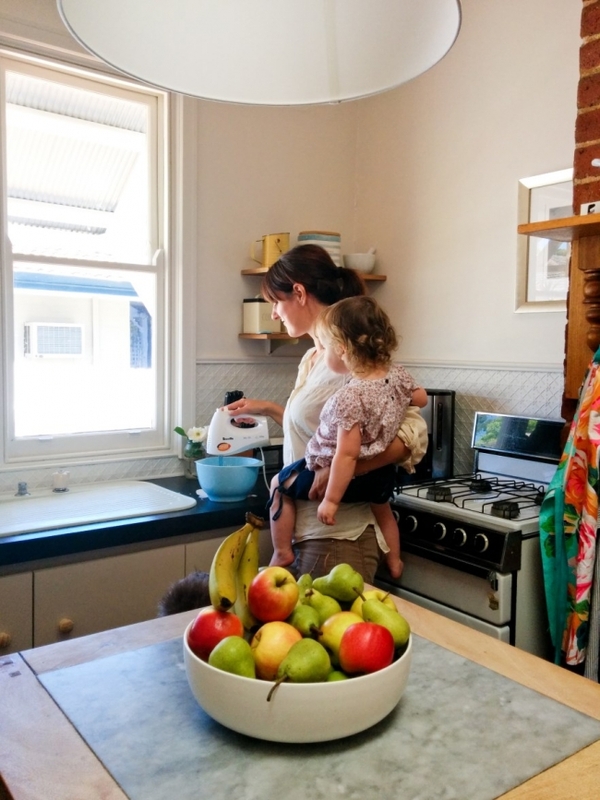 "We love that window and that it was from Anna and Ben's house, because we have been good friends since we were babies both living streets apart in East Freo." 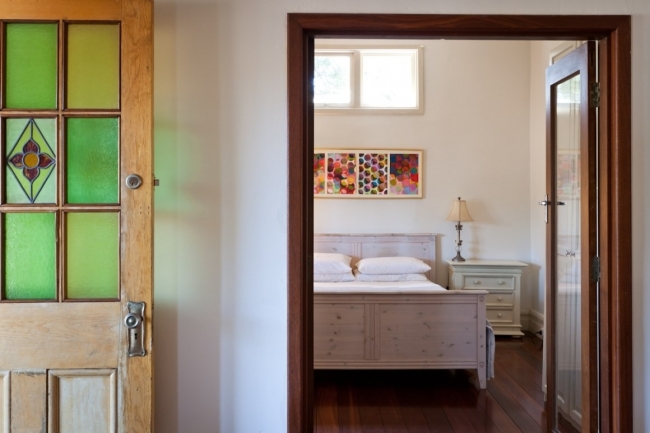 KATIE AND BEN'S BEDROOM: In this tiny (90sqm) cottage, there is not a bit of superfluous space like an entrance hall - the leadlight front door opens directly onto the lounge room, off which is the main bedroom. 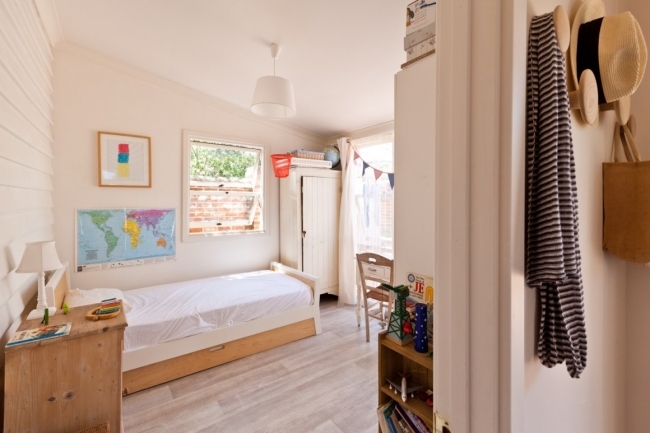 "Our bedroom has a lovely large sash window overlooking the enormous lilly pilly tree and it also has magical dappled light, particularly in the morning," says Katie. Photos by Heather Robbins of Red Images Fine Photography. 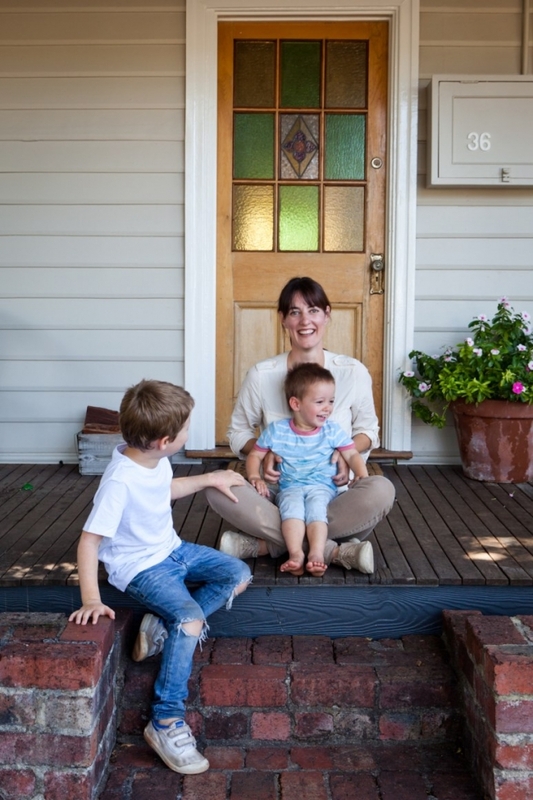 Owner Katie Stanwix and her two boys William, 5, and George, 2. Katie, a journalist, and Ben, now a lawyer, house-hunted in Palmyra for more than a year. It seemed like if it wasn't above their budget, it wasn't going up for sale. And Katie and Ben were becoming increasingly frustrated. 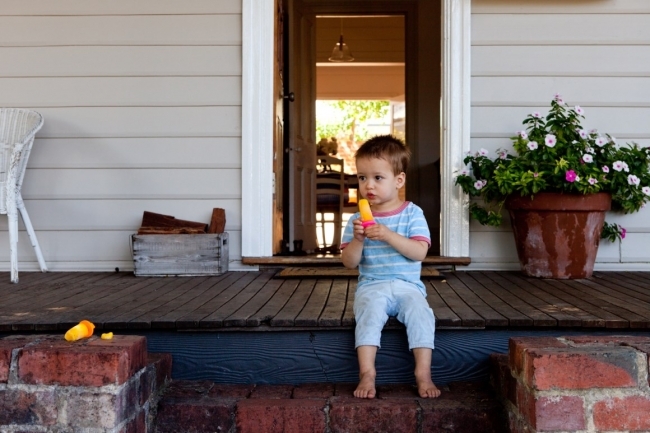 “One day we drove past this house and I said to Ben, ‘That’s ALL I want – a three bedroom weatherboard cottage, it’s my dream home," says Katie. “I said yes and he said that the owners were getting the house ready to put on the market that very week!" So dogged was their determination, Katie and Ben weren't about to let the house go to someone else. “Ben and I walked in while the owners were still painting the bathroom and said, ‘We’ll take it!’” laughs Katie. 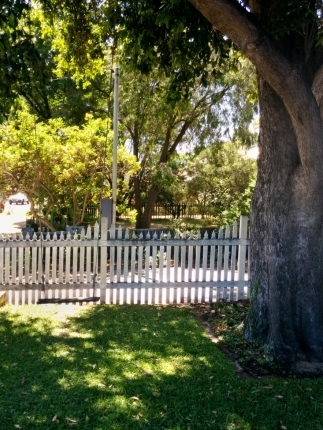 Built in the early 1900s, their little old house is one of the few remaining original solid jarrah weatherboards in Palmyra and with its wooden veranda, leadlight front door and huge lilly pilly in the front garden, it has a classic charm that has long attracted admiring glances from passers-by. 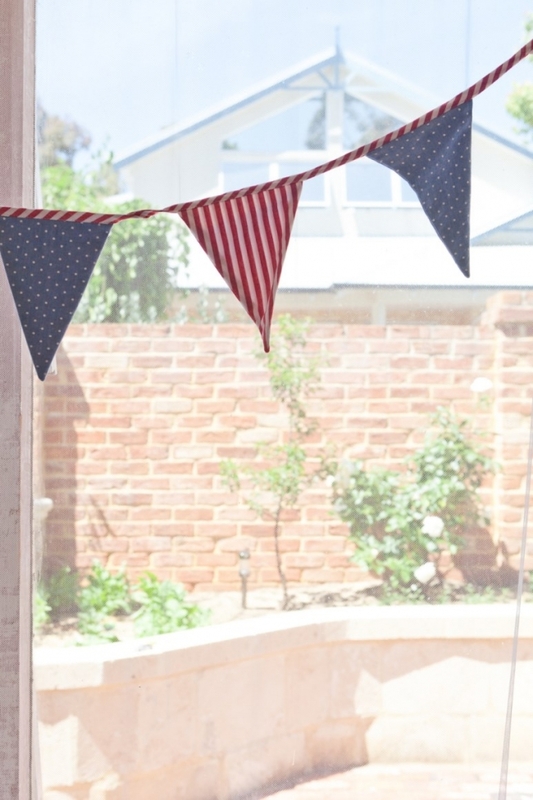 For a young couple, it wasn’t a cheap buy – so Katie and Ben knew the DIY and decorating needed to be done on a tight budget. "Internally some of the walls were painted a hideous aqua blue colour so painting it out white was one of the first jobs we did together," says Katie. 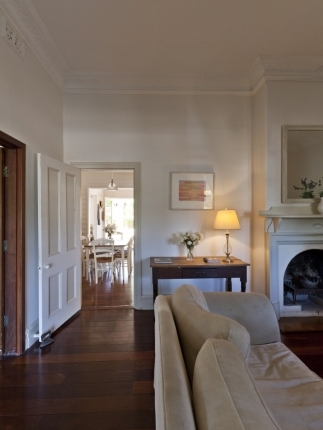 "We also ripped up the remaining carpet to expose all the lovely wide jarrah floorboards." 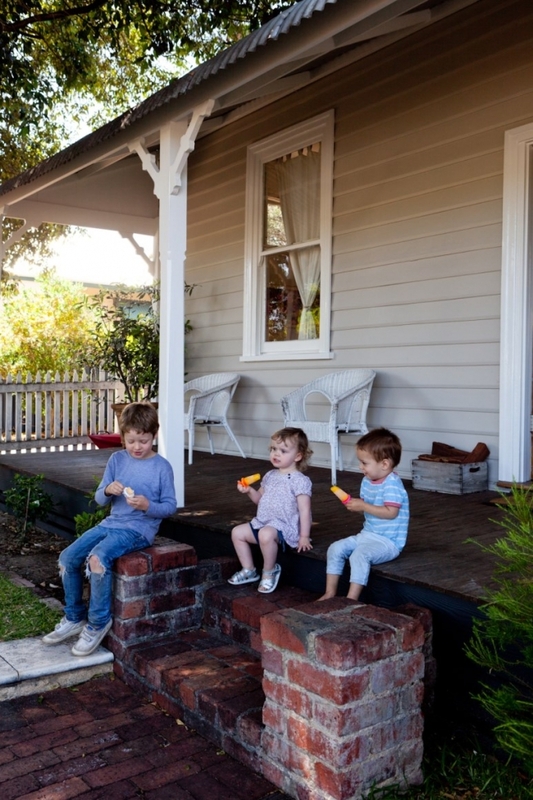 A NICE PLACE TO SIT: Katie's kids William, 5, and George, 2, enjoy icypoles with Heather's little girl Zoe, who was invited over for playtime, on the front porch. 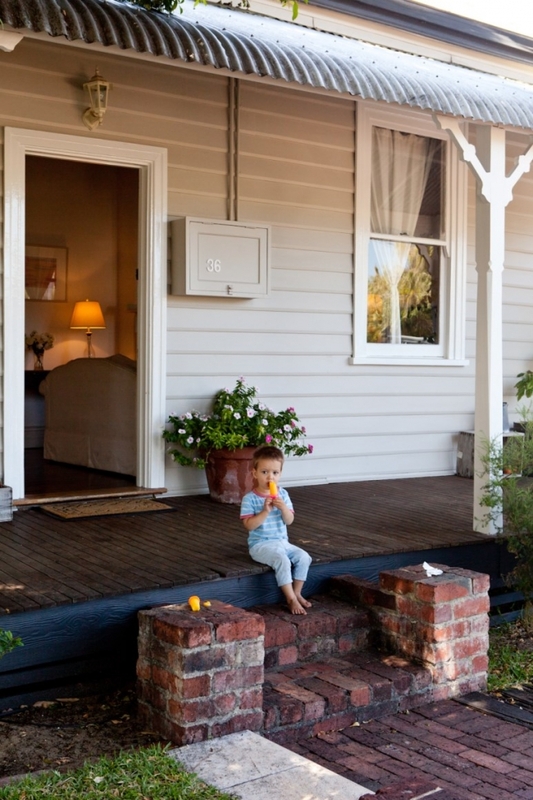 The weatherboard cottage was a creamy yellow when Katie and Ben moved in seven years ago. 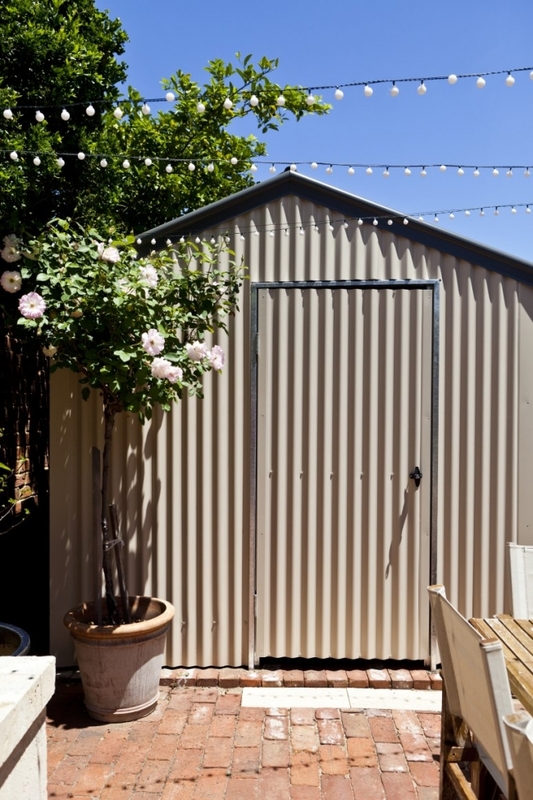 "We eventually had it professionally repainted in a light grey colour with white and charcoal trim," says Katie. Photos Heather Robbins of Red Images Fine Photography. 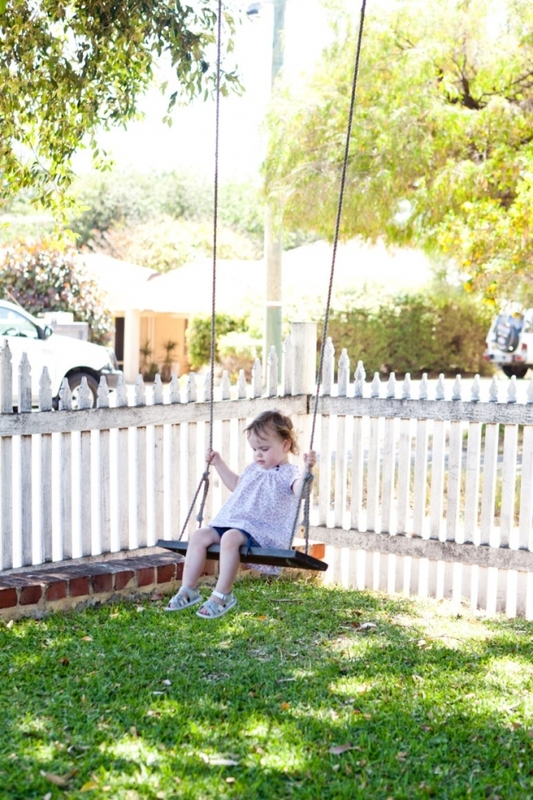 THE FRONT GARDEN: Ben made a wooden swing for William which hangs from one of the lilly pilly tree’s bigger branches. 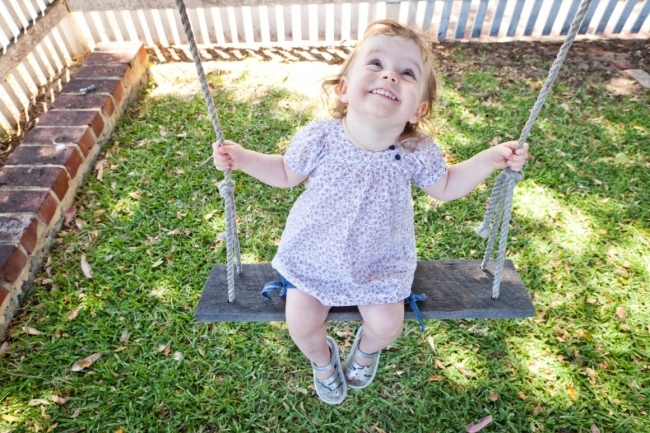 "The boys are really into the swing - they usually stand on it and swing and then leap off, as why would they sit down when they can stand and jump and do dangerous things, right?" sighs Katie. "But even we like sitting on it sometimes and looking up inside the tree’s twisted canopy. It’s a pretty sight looking up into those criss-crossing branches as the light filters through." 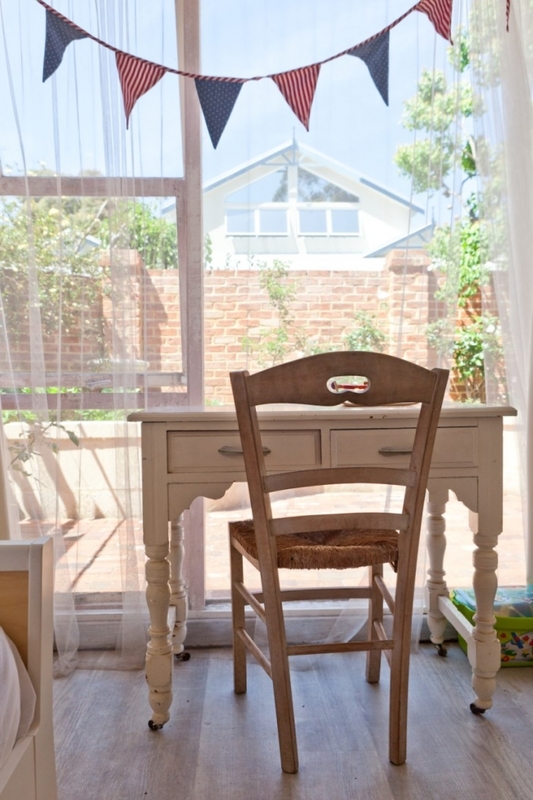 LITTLE LOUNGE: The lounge room has a cosy feel and overlooks the front garden. 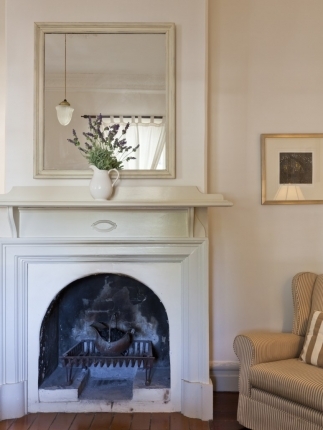 "We love being in the lounge room in winter with the fire blazing," reveals Katie. "We aren’t big TV people so we read a lot in there." 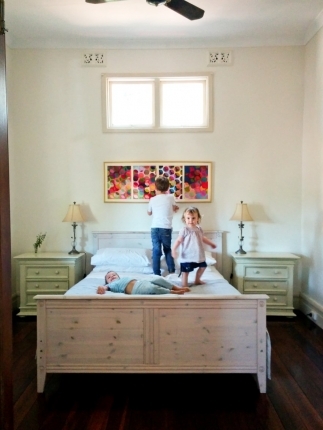 Katie and Ben collect artwork that they love. Sometimes when I've gone to interview someone like an artisan or a store owner for a newspaper or magazine story, I haven't been able to resist buying a little something off them - and Katie, also a journalist, knows the feeling! "We have an etching called The Pearl Fishers which I bought off Leon Pericles to mark William’s first birthday. I was interviewing him in his Mosman Park gallery for a story for West Weekend Magazine and ended up a customer." Photos by Heather Robbins of Red Images Fine Photography. VERGESIDE FIND: Amongst their secondhand decor is a wingback armchair in the lounge room, a verge throw-out from a family friend on View Terrace in 2006. "It was very worn and very floral but the structure was sturdy and lovely so I nabbed it and just bought fabric with a ticking pattern from Spotlight and recovered it for about $180 all up," says Katie. 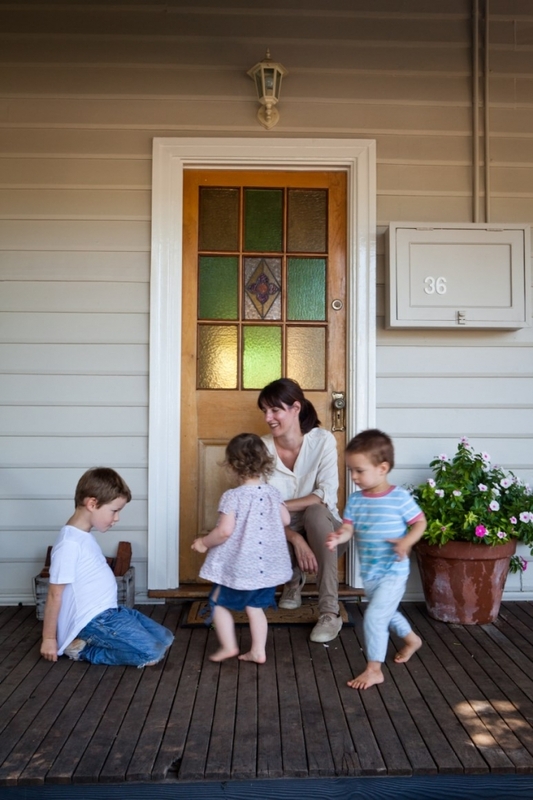 OPEN DOOR POLICY: "Our front door is always kept open," says Katie. "My parents were paranoid about this, saying, “But anyone could just walk in” yet we always joked that our insurance was that our neighbours had much fancier houses and belongings in their homes so why would thieves bother with us? And in seven years they never bothered. 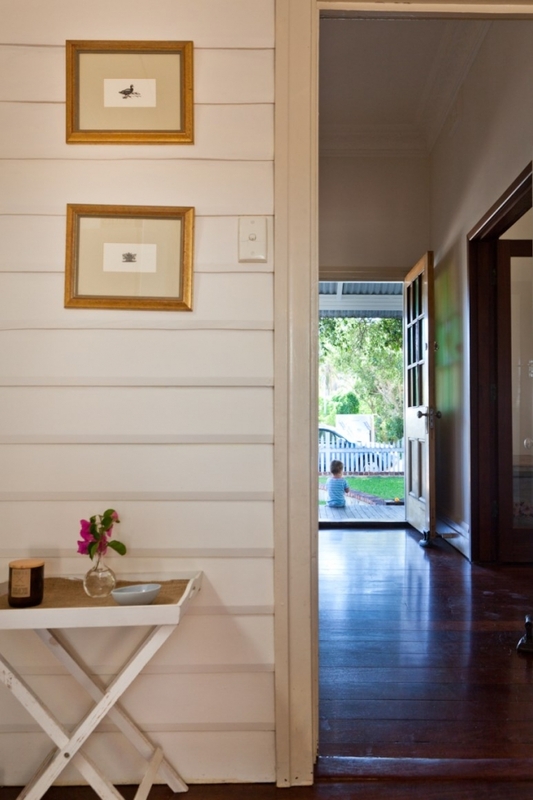 Having an open door was great because even when Ben was stuck at home working on the house, we still had people dropping round all the time on weekends. Then, when we had the boys, we did a lot less on the house because they were the priority, but when we did undertake projects at home they loved working with him. He’s so patient and he takes the time to involve them and show them how things work." VERGESIDE FIND: Like me, Katie is a fan of verge hunting and op-shop hunting! 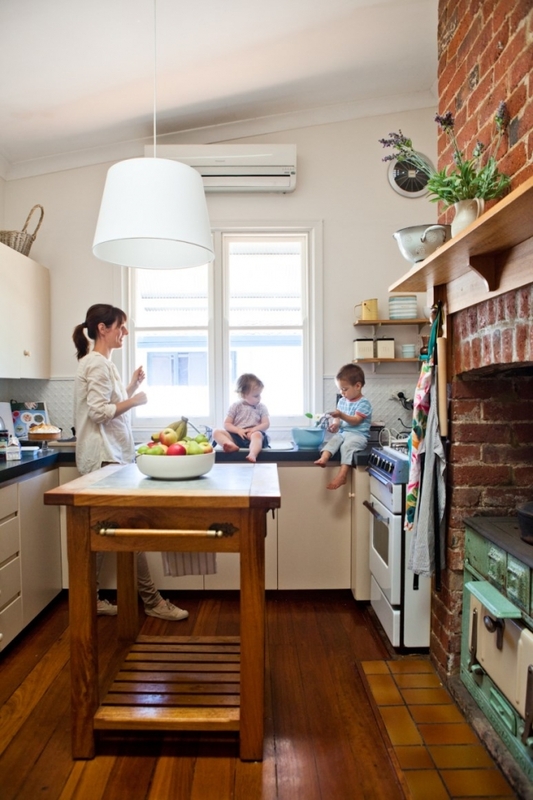 "The Bentwood chairs (you can see one in the corner of dining room) were on a verge in East Freo in 2010," says Katie. "We got six of them and I genuinely love them so I felt very lucky! Ben just fixed a few with wobbly legs. When we get our new dining table made (probably from Square Peg Home) we may just use the Bentwoods." Photos by Heather Robbins of Red Images Fine Photography. 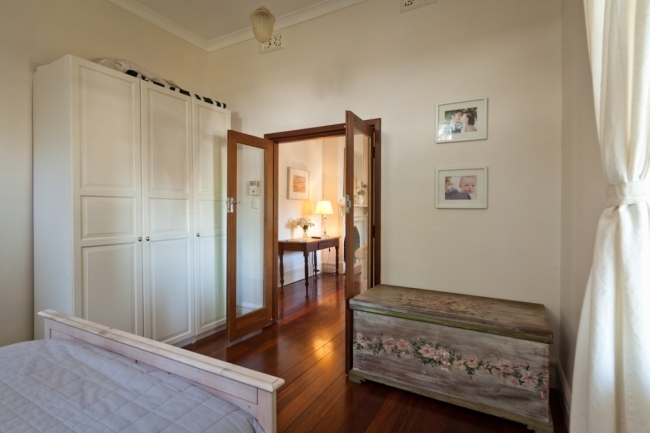 BEAUTIFUL FLOORBOARDS: The wide jarrah floorboards had been under carpet for decades but just before Katie and Ben moved in, some of the carpet was ripped up and the boards polished. 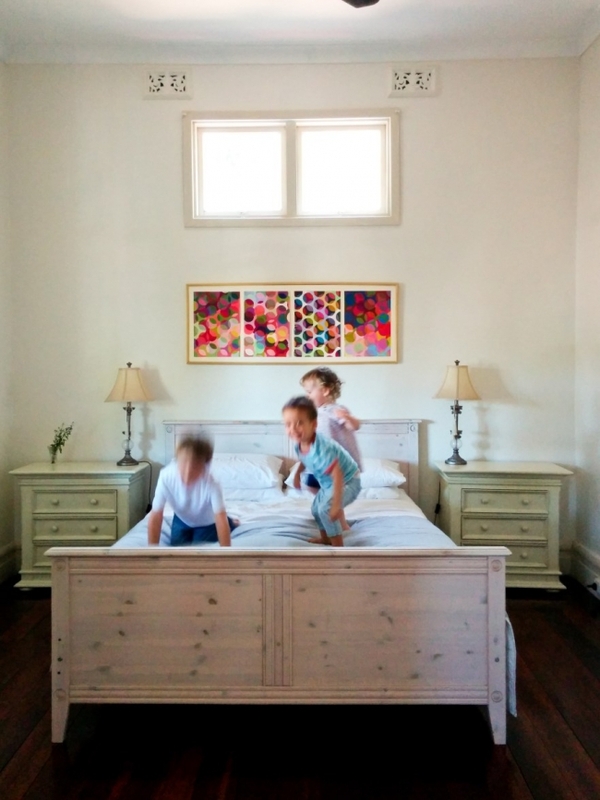 "We couldn’t imagine not having the floorboards exposed because they are so warm and forgiving," says Katie. 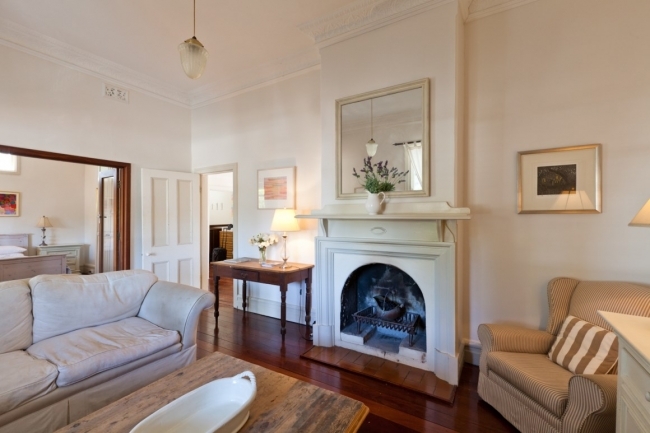 "I’d grown up in a Federation house with wide boards, and Ben had extra-wide Oregon pine floorboards in the old George Street terrace house he had lived and loved them. Once we had children and they were learning to walk (running by 10 months those maniacs were!) the floorboards were a relief in a practical sense. Mainly because old floorboards like these actually provide a pretty soft landing because they are on joists rather than on concrete, so mercifully for the skulls of William and George they tended to have a lot of give!" The gardens also received an overhaul. "The facade was classic with a lovely veranda - simple and the look we had been searching for - but the front garden was very confused," says Katie. 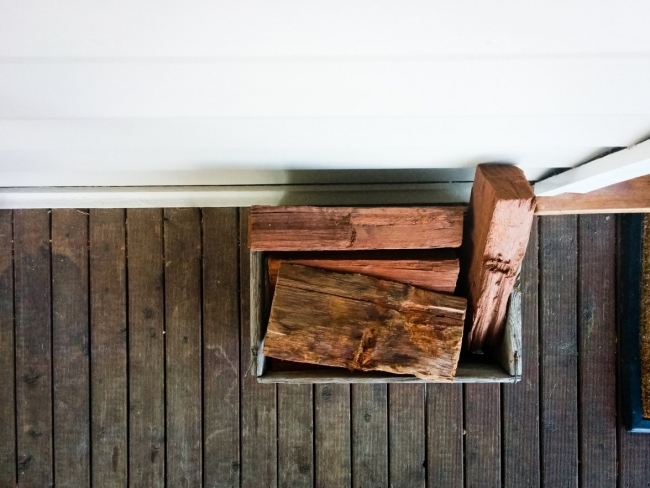 "It was piled high with woodchips with just a few lonely kangaroo paws poking out. The rest was a large patch of wonky brick paving and quite a bit of the home was hidden behind overgrown brambles. Just changing the front garden transformed the house! 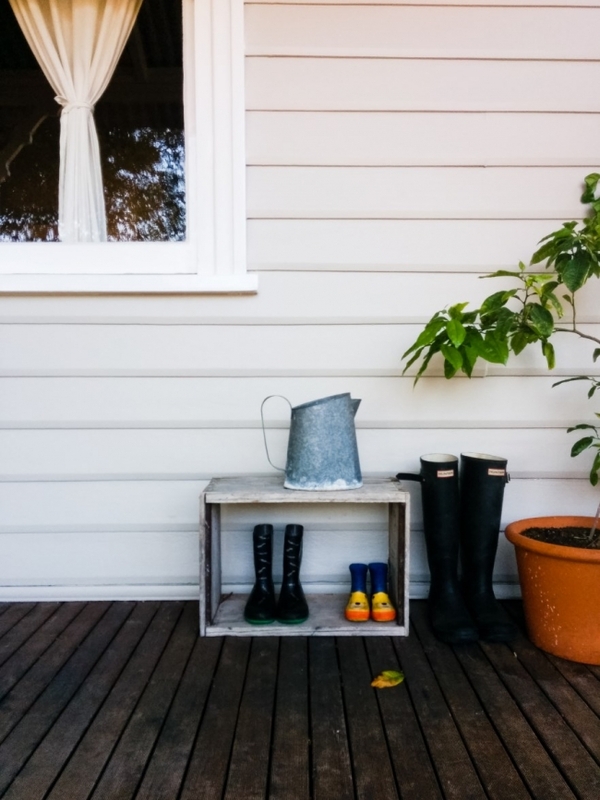 We spend so much time outdoors, especially on our veranda." Ben and Katie spent a lot of time removing stubborn vines, dirt, yanking out tree roots, pulling out a huge stump with a 4WD and levelling out the front yard. 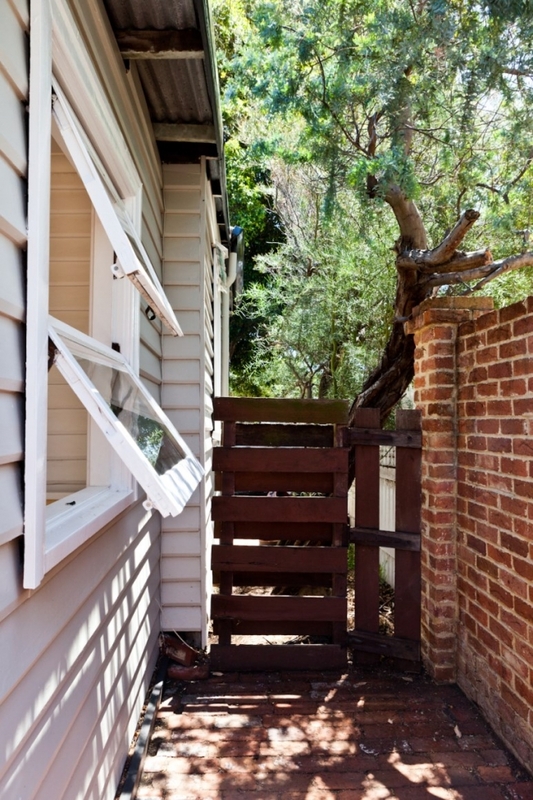 Ben pulled out an unsightly, rickety old carport that obscured part of the facade and replaced it with a driveway that runs down the side of the house, made from compacted red cracker dust from Creations Landscapes. 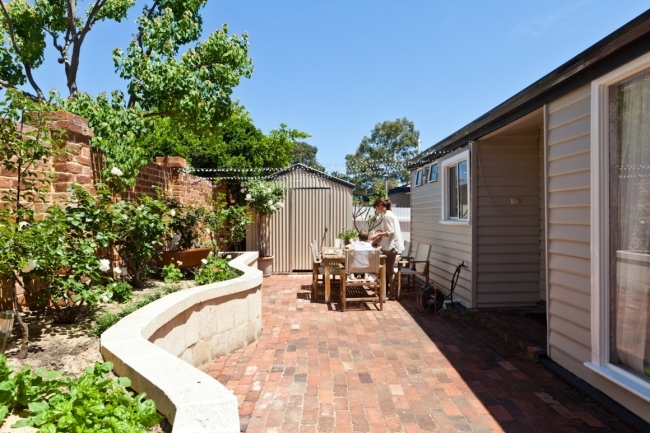 "He also laid grass and created a path to the house from the recycled bricks, then built a little timber and wire fence to seal off the driveway, used old grey timber sleepers from the back to build another little garden path towards the driveway," says Katie. "Just changing the front garden transformed the house! 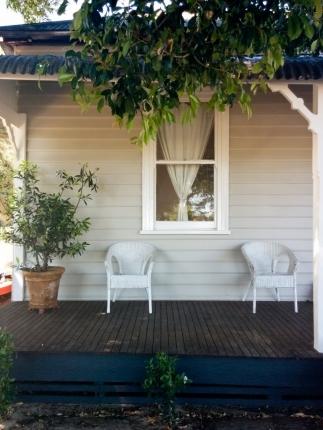 We spend so much time outdoors, especially on our veranda." Ben is definitely no stranger to hard DIY work - whenever the urge may strike! "I remember when I was about 37.5 weeks pregnant with my first baby and Ben suddenly decided to rip out all the old wall lining and the ceiling in the nursery," says Katie. "He was worried they were too old and that the nails had started falling out and the whole room would crumble on our baby. I just about had a heart attack because we were due to have the baby in a matter of days!" Yet Ben's industriousness paid off. Good man. 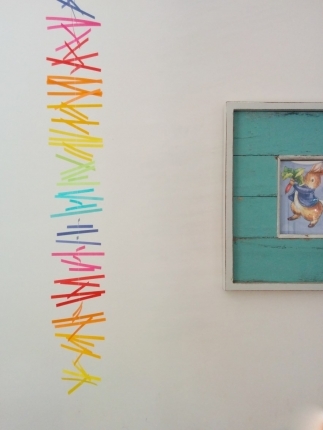 "He managed to put in new wall linings, insulation, new ceiling, replace the plasterwork, the window sill and paint - just before we brought William home from hospital," says Katie proudly. 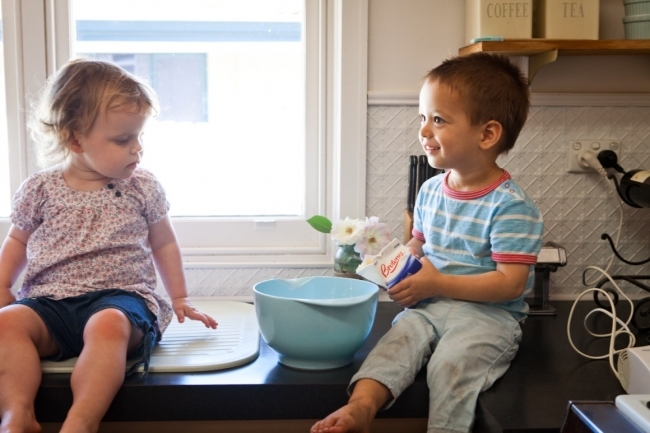 "He had even put all of the things I had bought for the nursery back exactly where I had initially put them – even the little fabric animals on the windowsill. He had to work through the night with a headlamp on for a week to get it ready in time! He’s very precise and patient and although he works at a good pace, it’s in his nature to get things just right." Katie freely admits that when they bought the house seven years ago, it stretched their purse strings as a young couple a little. "Ben was just an article clerk back then, and we had both come back from living in Europe and spent all our money travelling to as many countries as we could while we lived there," says Katie. 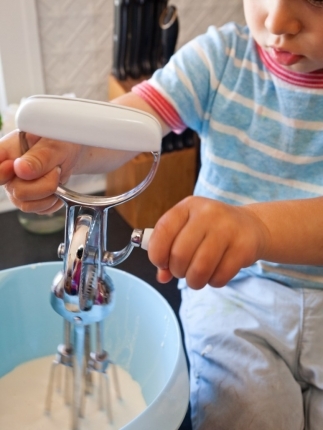 "I’m still glad we did that – but when I fell pregnant earlier than expected just after we bought the house, we didn’t have a lot left over. 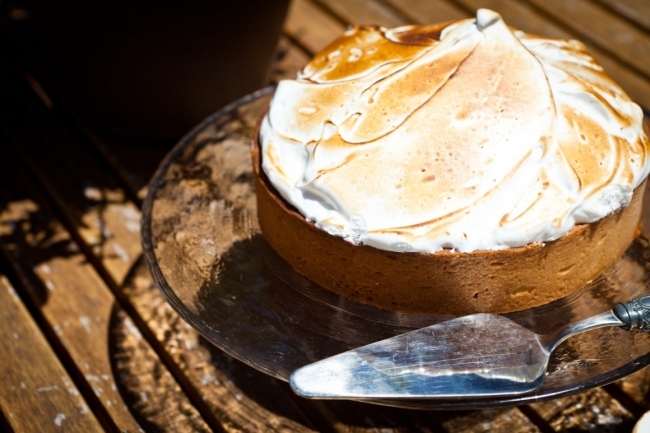 Our circumstances are a bit different now, but when we bought our cottage in 2006, we spent all of our money on getting the house and had very little left over for furnishings." As a result, having to be frugal has manifested in the thoughtful way they have carefully and lovingly furnished their little home. "About 95 per cent of what we bought was secondhand and we were chuffed with what we were able to pick up," says Katie. 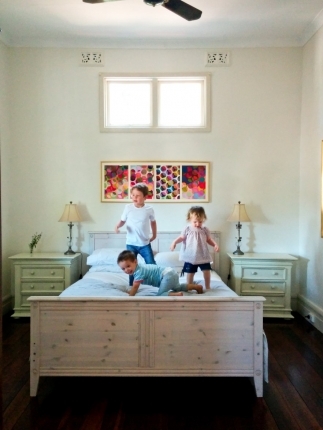 "Now nearly everything in our home is still secondhand and not a lot has changed in seven years. I don’t go shopping much because I’m busy outdoors with the boys and we don’t have internet connection at home, so I don’t browse or shop online. I do appreciate beautiful things but I can enjoy admire things without coveting them or feeling like I ‘have to have’ things. The consequence is I don’t buy much. I’ll buy something that I really love and tend to only replace it when it's officially pronounced dead! That said, I do give a lot of thought to what I’d like to buy when I do need something." WILLIAM'S BEDROOM: One of the things I love about this house is that every single window has an outlook of treetops or greenery. It makes it feel very private. I loved William's sweet bedroom. 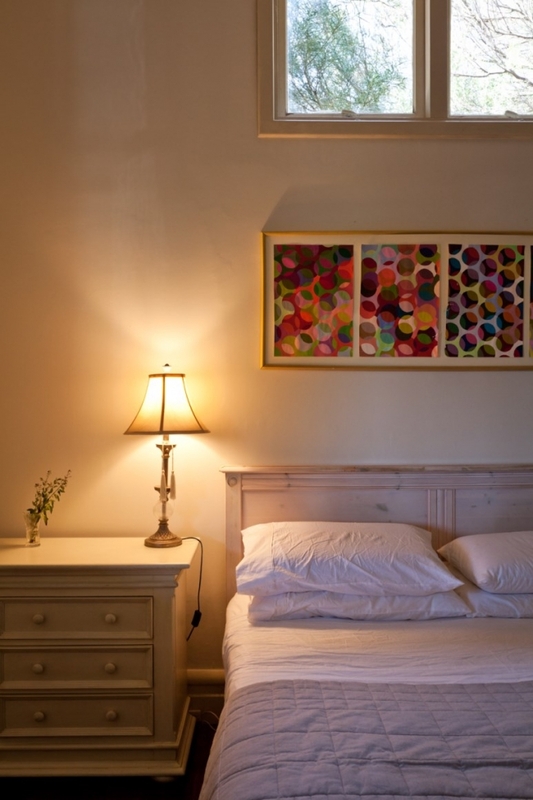 "William's bedroom has particularly beautiful light and overlooks an interesting assortment of trees and those views change with the seasons," says Katie. "It’s a good reading room." Photos by Heather Robbins of Red Images Fine Photography. DINING SPACE: In the Stanwix home, the dining room is the axle around which the other rooms and family life rotate. 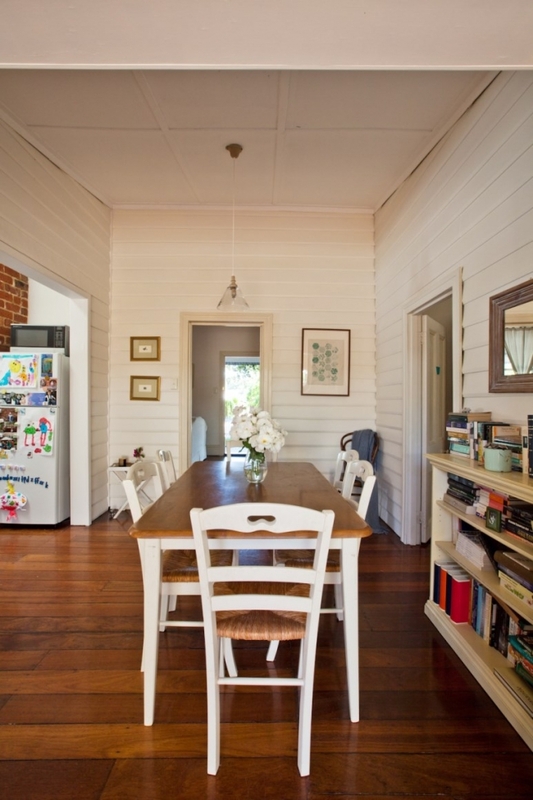 It features exposed weatherboard walls, and is where the family eats dinner together when they're not eating outside. From here, Katie and Ben can keep an eye and ear on the boys playing anywhere in the house or garden. Photo by Heather Robbins of Red Images Fine Photography. 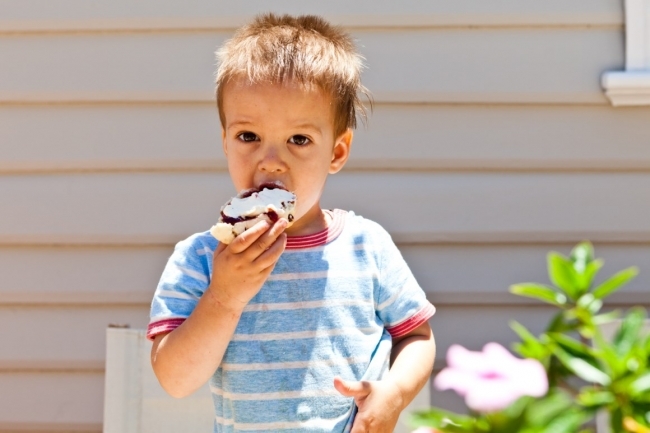 DINING ALFRESCO: With two small active boys, dining and entertaining in the Stanwix residence can be a riotous and colourful affair. "It’s pretty casual and a bit of a free-for-all," says Katie. 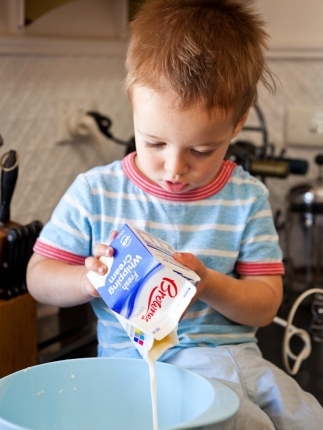 "I love cooking and Ben has a huge appetite so there is usually a lot of food to share around. The kids have a little table they can all sit at if there is not room at the main table. 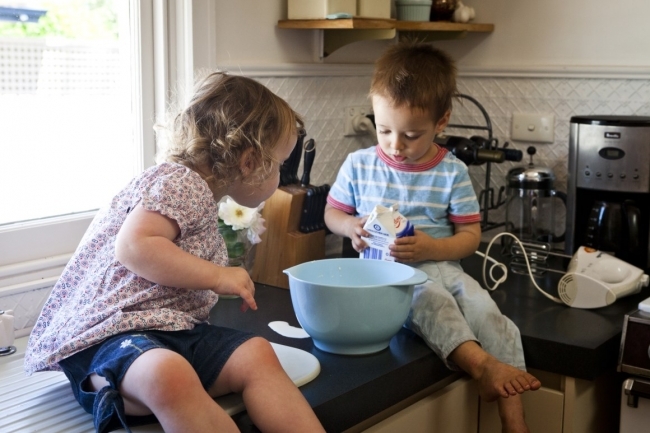 Being a small house, it can be pretty chaotic and noisy with the kids running in and out, but our friends are all pretty laidback people and don’t mind the chaos! I’ve also had plenty of dinners with friends where we are just eating off plates on our knees on the veranda or perched on the wall in the back garden. It’s wherever the kids are really. 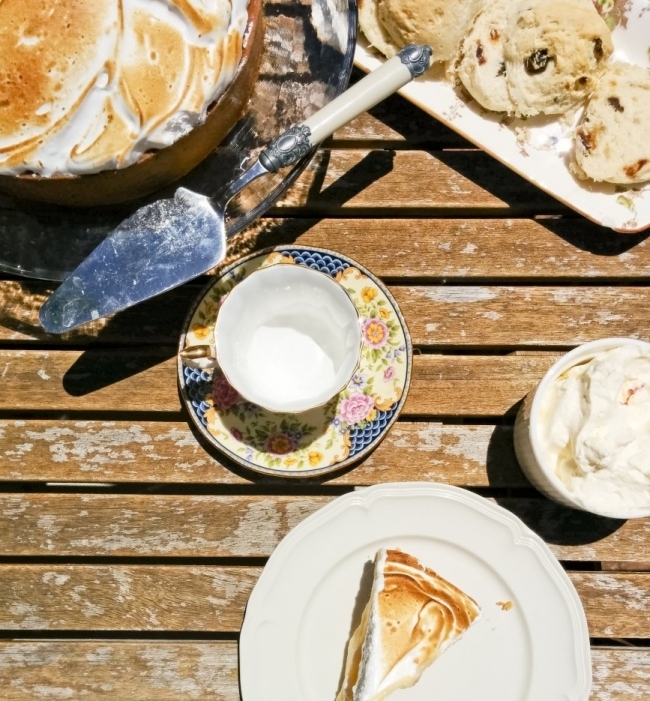 I just lay the food out on the dining table on big plates and put out serving spoons and people can do what they like." 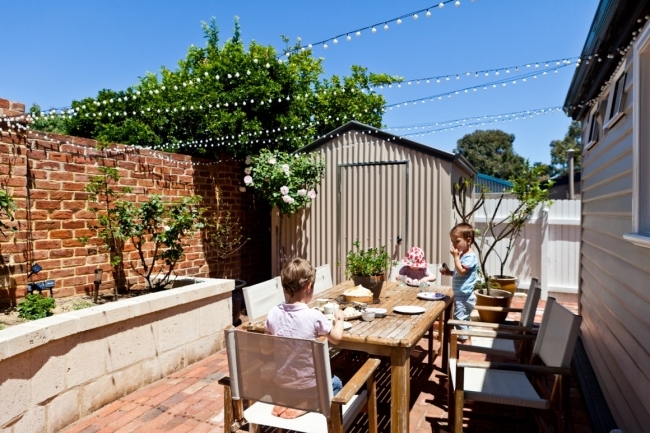 The house has a recycled brick-paved alfresco entertaining area out the back, where fairy lights, rose bushes and a raised vegie garden create a favourite space for outdoor dining. Katie and Ben's sons William and George love their little house so much, it seems like they think of it as a person, perhaps another family member. "Every time we pull out of the driveway, they shout, 'Bye bye house – toodle roo – we’ll be back soon to see you,' "says Katie. "Every time – they never forget! I don’t think there’s anything in particular they love about the house, but I think they have formed an impression of the house as just a comfortable and happy place to be in. 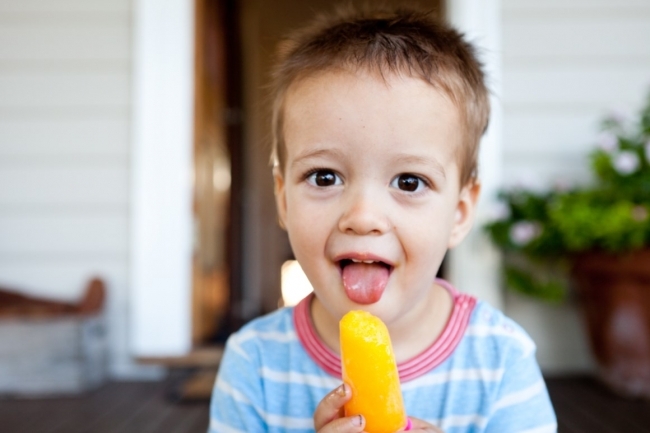 I know they love being at home and they love their house because they tell me." 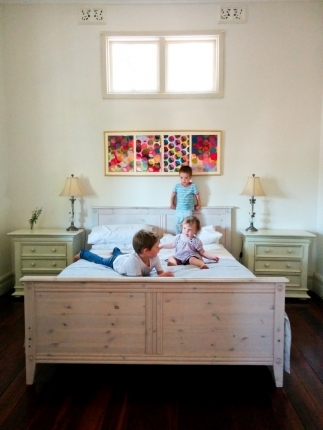 SECONDHAND FURNITURE: As they furnished their house on a shoestring budget seven years ago when they moved in, Katie estimates 95 percent of their furniture is secondhand. 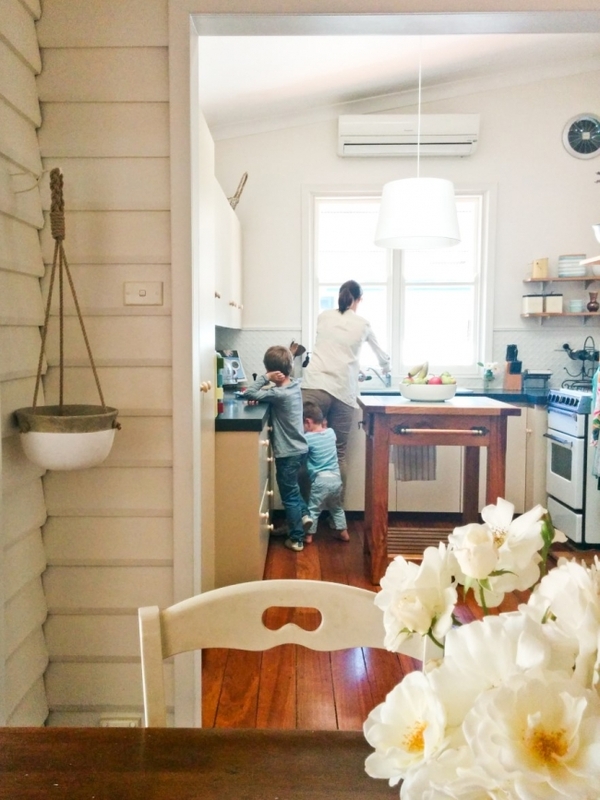 "I was lucky enough to pick up a lot of lovely furniture off my Aunty Jenny and Uncle Mark when they sold their home in Subiaco right when we moved into the cottage," she says. "They had beautiful things, all one-off pieces and antiques. 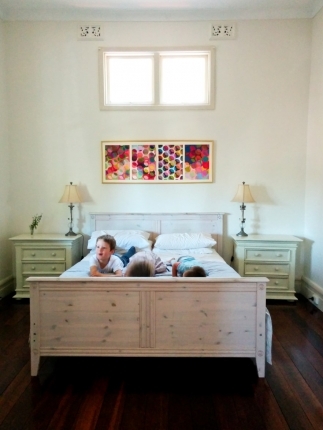 I took some of the smaller things, such as a large timber blanket box which was beautifully handpainted by a well-known Perth artist and I still love it so much. I also took an Australiana table, her coffee table which is raw Oregon pine and another timber wardrobe which is limewashed and in George’s room. I also bought two Murray Gill Paintings off them which we love." Photos by Heather Robbins of Red Images Fine Photography. WORTH IT: The dining table in the house was ‘just a cheapie’ from the RSPCA op shop around the corner. “It was someone else's throwaway of course!” laughs Katie. 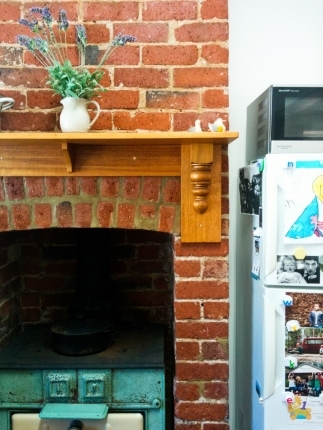 “It's nothing special to look at except my lovely aunty Verian put it on hold for us the week after we moved in in 2007 because we needed something that didn't cost much and fit the space and she spotted it for us. Ben carried it home with a refrigeration trolley because we only had a little Laser hatchback then with no tow ball!” Photos by Heather Robbins of Red Images Fine Photography. 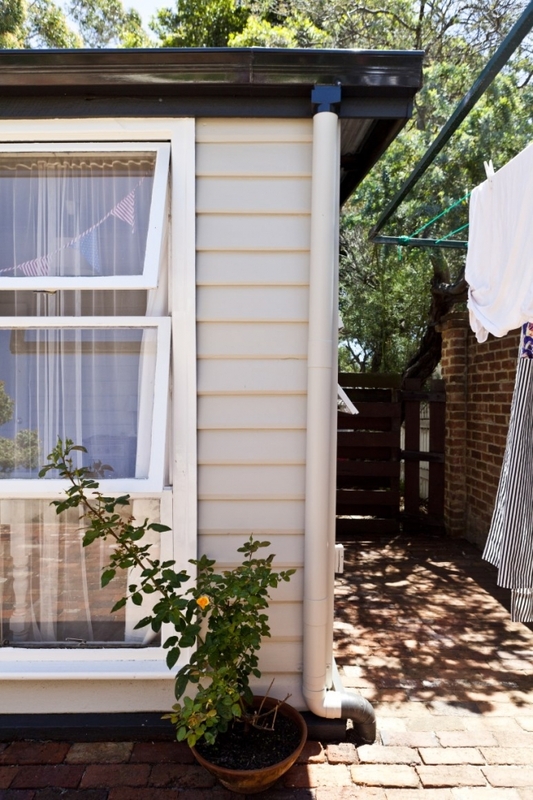 At the back of the house is a door to the laundry and simple bathroom. HANGING PLANTER: Katie and Ben used an IKEA curtain rail to hang this cute planter to the wall. 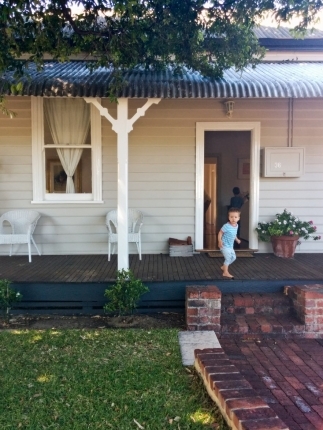 It's a little house - less than 100sqm - but so far it has suited the Stanwix family well. 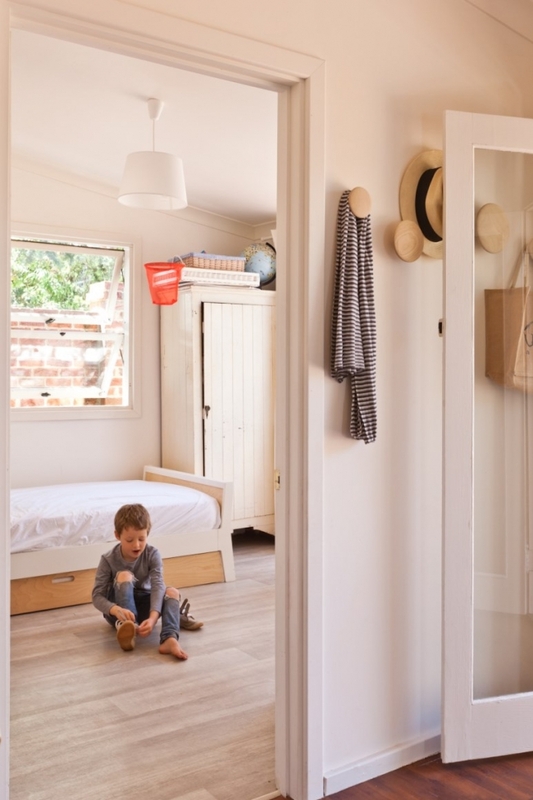 "It’s only 90sqm internally so we live in close quarters but I find it quite comforting to know the boys are always right there," says Katie. "I’m sure in a few years I’ll feel very differently! They’ll want their own space too." And it is partly why, after many long, heart-aching debates, Katie and Ben have decided to leave their first home - they are now expecting Tyrant Number Three. "Our third baby is on the way but in this little house we know there is nowhere to put our next baby!" says Katie. "And telling William to move out of his room and into a tent in the back yard just didn’t seem right somehow." I would NEVER guess that it's only 90 square metres! It looks so spacious. What a fantastic use of space. I remember you saying this property was up for sale a couple months ago and I did take a look at it. I ended up with something else though, and hope to make it as lovely and homely as they have made this wonderful little place. Another beautiful cottage. 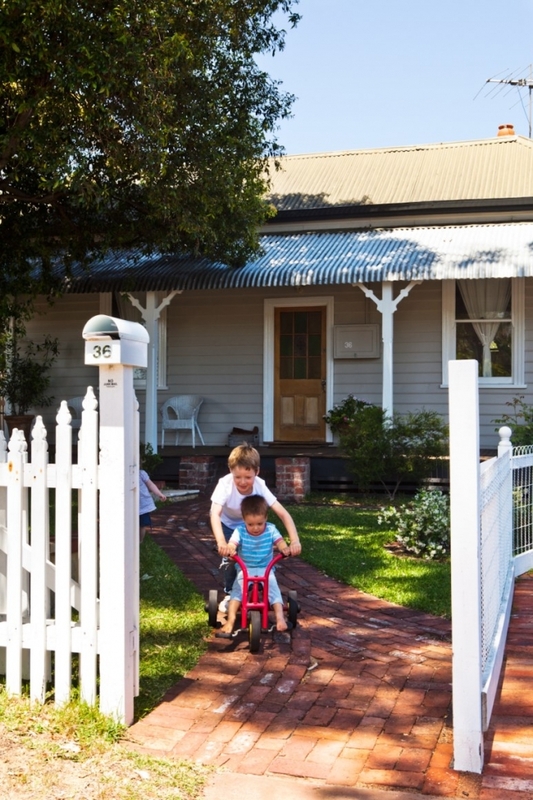 I love the fact that young families are embracing these old weatherboard cottages and infusing them with modern life. Me too! Palmyra is such a nice suburb for young families too. This street is my favourite Palmyra street! Love the house. Where did they get the string of lights outside in the alfresco area? Hi Tania, I loved the lights so much myself I got some for our alfresco too! They are little solar lights from Bunnings but were quite hard to find - my local Bunnings only had two boxes. Hope you manage to find some. ahh so beautiful! They've done such a great job at keeping it simple ?? I agree! 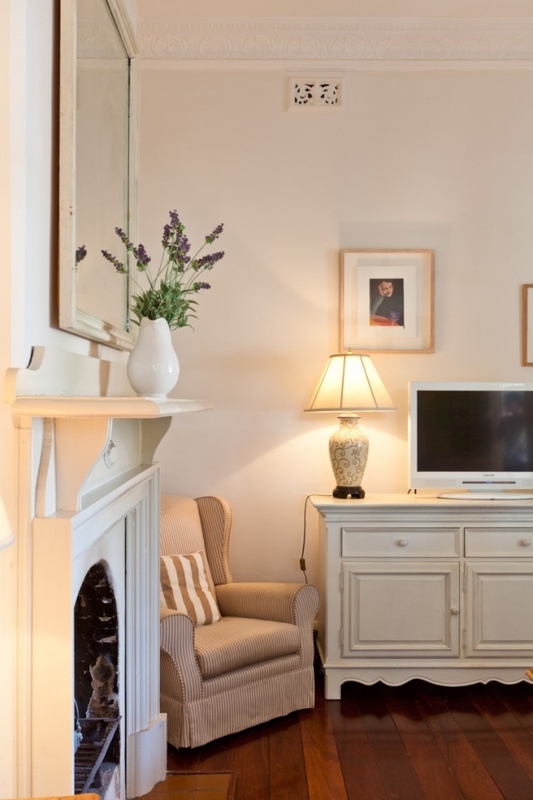 Simple and uncluttered - which I think makes it feel extra-calming and restful. Gorgeous, charming home. The colour palette is so gentle, would love to know the paint colour of the front exterior if anyone has any idea? Isn't it pretty? I just asked Katie and she told me it is Dulux Beige Royale, done at double strength because the exterior gets so much light. She said another nice colour they tried was Wattyl Chino with Surfmist trim after knocking on a woman's door asking for her colour scheme! Ah you're a legend thank you Maya (and thanks to Katie). I usually waste loads of time and $$ with sample pots and guesswork. My husband will be very pleased not to have splotches of paint all over the house for the next month! What a charming cottage. 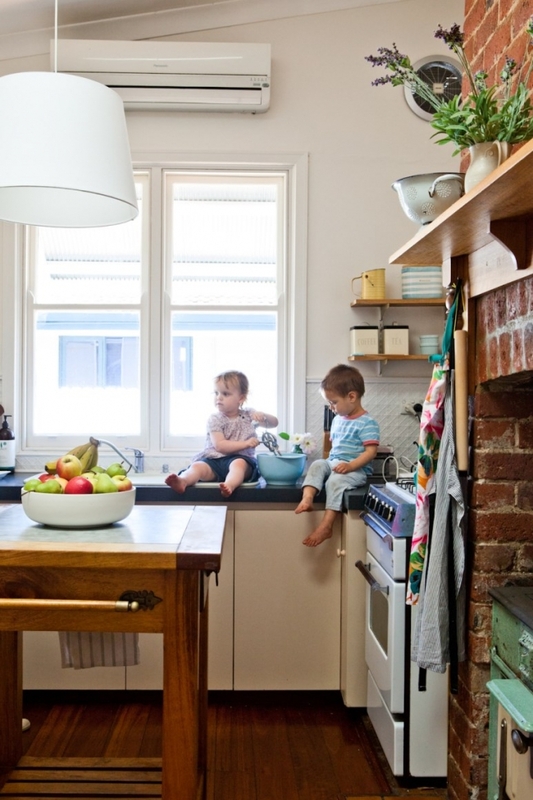 I saw the kitchen picture (with the big brick fireplace - aaaah) flash by on Instagram last night and I saw that there was a new blog post but I did not want to look at it then and get all excited with my brain buzzing when going to bed. Katie's statement "Our home does not have a single 'fancy' feature" is very funny - yeah, maybe there is not a single feature standing out but that is because the ENTIRE cottage is perfect. It has so much going for it, especially the super high ceiling which make it feel visually much bigger. I am amazed by the amount of work Katie and Ben have done, and also by how well done it was. It is clear that Ben is extremely talented. I learned a new term: pilly lilly tree - must look it up, have never heard of it. Beautiful little place, and lucky the new owners who get to buy it from Katie and Ben. I only hope they will cherish its historic character and features as much as the current owners did. And darn Heather - must her photos always be so good? - the cake makes me drool. Hahaha! :) that is so nice! I love this cottage so much too - especially knowing how they did so much on a budget and by themselves. It makes it even more impressive. I love lilly pilly trees! I planted two in my parents' garden when I was 15; they are both now even taller than their two-storey house. 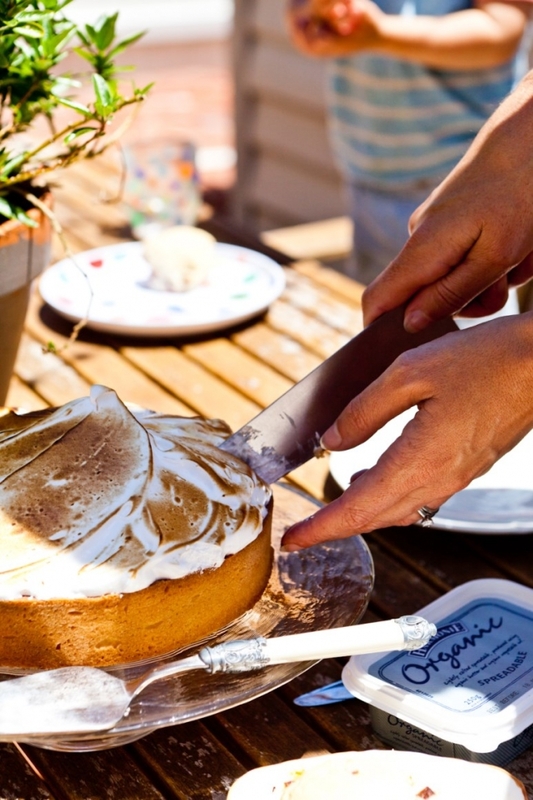 Heather's photos are forever good... that cake looks like something in a food mag! Hahaha we always wanted to go to the Dinosaur Park too but more often got taken to Three Bears or the one next to the preschool (although Mum would get cross when we got the rotting Moreton Bay figs all over our clothes). Palmyra Primary School is where I went to school and I loved the oval and the peppermint trees! You have a gorgeous blog by the way! I was so thrilled to see this post. 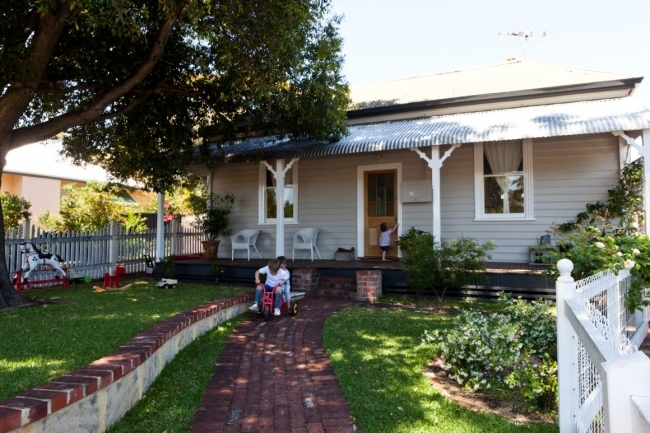 Boyfriend and I have a weatherboard cottage in Sydney that is very similar to this property - same size and similar external look (though our original internals made the Crap Shack 'before' shots look like Versailles; we spent nearly a year cleaning and fixing stuff before we could even move in). 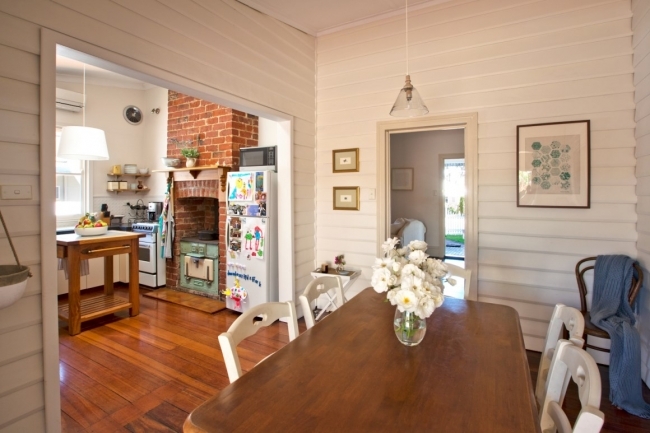 Katie's colour scheme is precisely what I've been thinking of for our place but I've been uncertain about whether it would work for a weatherboard, so I am rudely excited to see how good it looks! Definitely planning to steal this paint scheme before 2015 is out. Hahaha :) my God, the internals of your cottage must have been REALLY bad! 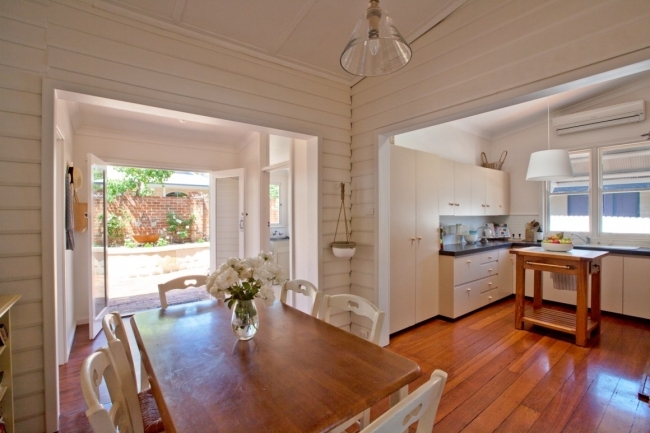 Weatherboard cottage in Sydney sounds like dream home material though. I think Katie's colour scheme is gorgeous too - she told me the exterior was done with Dulux Beige Royale done at double strength because the exterior gets so much light. She also said another nice colour scheme they tried was Wattyl Chino with (Dulux?) Surfmist trim. I hope it works on your place! Hahaha very true! 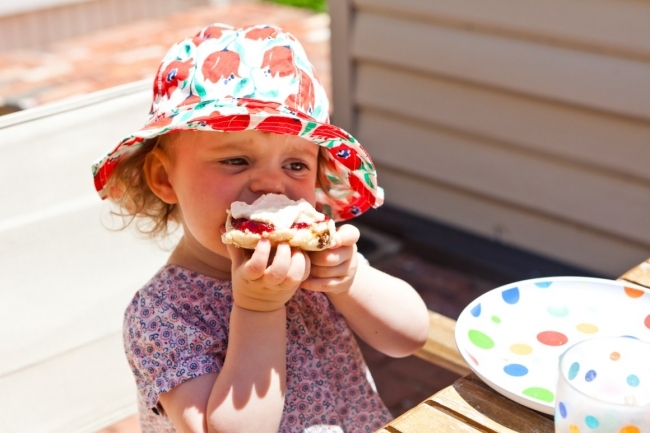 It is a suburb for scone-eating! 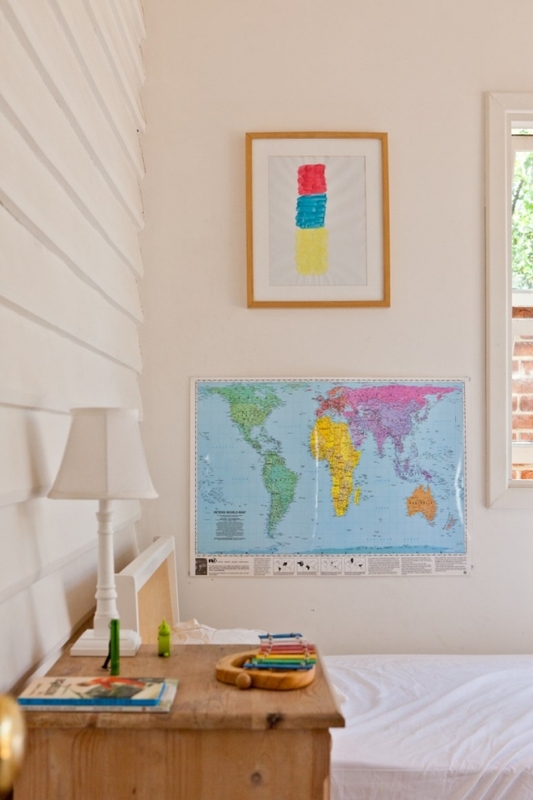 :) I am pretty sure the round timber hangers would be Muuto The Dots coat hooks - http://www.muuto.com/collection/the_dots_coat_hooks/ - I can't remember who sells them in Perth but I would try to Google them for online purchasing!